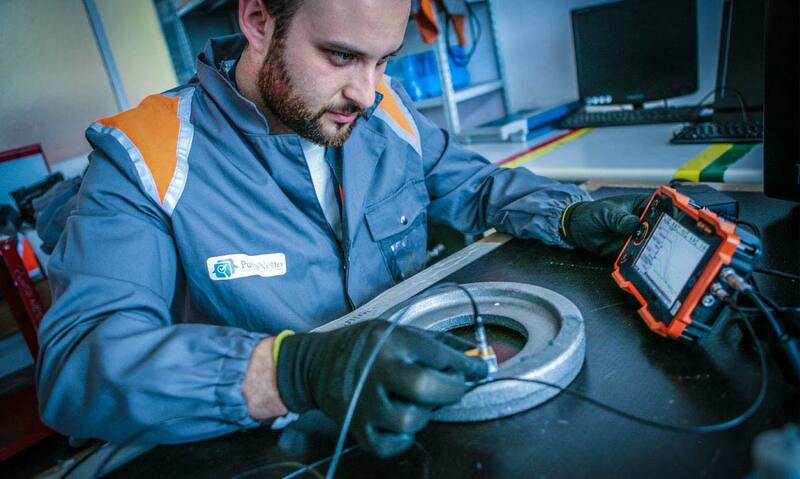 News: The ultrasound technique was introduced as a tool for non-destructive testing in 1960. It has since undergone an intensive development and has gained more and more acceptance. To date this is the technique primarily used for the validation of structures in many service applications: in fact it excels in the possibility of identifying position and size of the defect as compared to other methodologies and also allows the detection of many types of defects without the need to modify the instrumentation. The fact that the 'application of the method of ultrasonic non-destructive analysis is simple, implies that also the procedures and equipment are relatively simple and therefore less expensive compared to other techniques (X-ray radiography for example) that require, to obtain same results, more complex structures and consequently with a greater expenditure of resources. Punto Netto LTD of Griso Gaetano provides technical support and quality control to engineering firms / automotive, by using ultrasound techniques. Punto Netto staff is composed of personnel certified to Level 2 according to EN ISO 9712 and all the checks and tests are carried out according to strict safety standards. The ultrasound non-destructive testing techniques are all based on the analysis of the phenomena of diffusion and reflection that ultrasounds undergo when they pass through a body of finite size. Ultrasounds are elastic waves with the vibrational frequency of between 1 and 10 MHz (for certain applications it can extend the range from 20 KHz to over 200 MHz). The ultrasonic waves spread in a material with a characteristic velocity and are reflected when they encounter a separation surface between two materials having different acoustic impedance ( surfaces of the examined workpiece, internal defects, voids, inclusions etc.). In summary, the technique A-scan is a technique timely since it allows to detect intensity and crossing times of the ultrasound with reference to a single point of the specimen; the B-scan technique is a technique for lines since it allows to detect intensity and crossing times relative to the points placed in a line of the examined component; C-scan technique instead allows the relief of intensity and crossing times relative to the points of a scan plane x-y which can be varied appropriately in order to investigate the entire volume of the analyzed model. Among the three techniques, the C-scan is undoubtedly the most widely used in non-destructive testing. This technique consists in the identification of the presence of an echo due to reflection of the beam on a reflector. This echo is absent if the tested part is intact. So the ultrasound testing is a fast, effective and inexpensive inspection for the volumetric checking of simple or complex structures and components. The control must be performed on the whole volume of the piece so as to leave no unexplored areas. In the case where this is not possible because of the configuration of the detail to be examined or for other reasons, it must be reported in the checking test report. The probe must be moved on the control surface with an overlap between one step and the other is not less than 10%. The scanning speed of the probe on the workpiece must not be higher than 150 mm / sec. The coupling means to be interposed between the probe and the surface to be examined must have good wetting characteristics, and a good transparency to ultrasounds. The coupling mean should be chosen so as not to damage the surface of the detail. It is important to use the same mean of coupling both for the calibration of the machine that for the control. The area concerned by the ultrasound inspection must be sufficiently smooth so as to allow a good fluency of the transducer. From the checking surface must be removed: slag, spatter, dust, dirt, paint and anything else that could compromise a good coupling between the probe and the surface to be examined. This technique uses the signal reflected by any interface within the particular examined. The signal is characterized by the amplitude and position along the time axis which, in turn, depends on the distance between the discontinuities present in the material and the probe. The location of the discontinuity is defined on the basis of this distance, from the direction of propagation of the sound and the position of the probe. • an amplitude correction curve distance (D.A.C.) or to a series of D.A.C. curves built using sample blocks with artificially made discontinuities (holes drilled laterally, plane holes, carvings, etc ....) • a diagram of equivalent reflection, method A.V.G. • when you have doubts about the correct functioning of the device. • reference samples are required both for the calibration of the apparatus and for the characterization of defects. Punto Netto LTD of Griso Gaetano overcomes these disadvantages by being able to offer its customers technical assistance in the choice of the non-destructive method that best suits the component to be analyzed and that better meets the needs of its customers. It has always taken care to provide high quality products, which are the result of continuous investments both on the training of its personnel and processes. Also on prices Punto Netto is to be competitive on the market both for the activities to be performed at the customer site and for the long-term ones. In addition, as evidenced by the previous articles, the advantage that only Punto Netto can give is to be able to organize all the related activities so as to free the customer with the advantage of having a single interlocutor. For all these reasons, we recommend that you contact Punto Netto not only for a quote which, we are sure, will certainly be beneficial, but also to experience the seriousness of the organization and the wide availability of all operators.